"Crop Circle numbers appear to have declined, but the counts do not include all the design locations. Those that appear in countries other than England get scarce attention from the CropCircleConnector website, which is England centric. Local media may report a design, or word of mouth may inform people. But the decline in attention is deliberate. As the author of Secrets in the Field computes, until 1991 designs were 99% genuine but since the year 2000 95% were hoaxes. The media gave attention to Crop Circles as long as the hoaxes were handy and prevalent. "But why the decline now of late? Primarily, the battle for the Awakening to the alien presence moved to direct contactee face-to-face meetings. In 2008 contactees numbered approximately 12,000 but by 2016 the count was 3.5 billion and rising. The media cannot compete. Now the elite are concerned about suppressing reports of Snake Man mummies found in Peru, being spread by the Internet. The elite fear that any attention given to Crop Circles will remind mankind that aliens are real and are visiting Earth. The less said the better, so reporting is suppressed." "Competition is a natural adjunct to life. In lower forms of life it makes the difference between living or dying, getting food or losing out in the search for and acquisition of food. There is competition for the best mate, which is inherent in nature for the selection of the best traits to be passed on to the young. There is competition for the best hunting grounds, the best grazing areas, with the stronger pride or herd gaining better nutrition as a result. So what happens to the competitive urge in higher forms of life? Does it disappear? It is too ingrained in the genetics to simply be put aside, so in Service-to-Other cultures is put to good use! "Certainly there is a sense of competition among circle makers, but it is not for something as simple as bigger and more impressive. It is gauged on how well humanity gets the message. If the message is well placed, and understood, then that team gets the credits." Meanwhile, in 3rd density, any competition is for bragging rights as crop circle hoaxes become more sophisticated. "There are no field reports available as of this day but if they were, they would show yet more evidence that this design is entirely manmade. No bent node grain. How difficult is it to quickly make concentric circles? One walks along the field tracks and plunks down a circling device that is positioned repeatedly for rings. Thus having established a walkway around the circle, little details are within reach of the team. Professional teams have been employed over the past decade or more to effect professional hoaxes, designed to mislead the public. This has obviously inspired competition, and inspired designs being used to promote products, of late. There is, thus, no message from aliens here, in this simplistic and sloppily made fraud done for bragging rights." "Where this design utilizes the circles and curves which characterize those laid by the true circle makers, it is a hoax. To effect the curved designs is easy in this case, as one pins a line in the center and gradually increases the distance from the center as one travels outward, counterclockwise. The interim lines are laid by one person located on either side of the flat strip. There is no part of this design that requires footsteps to be laid in open grain, a point of authenticity found in legitimate circle designs." "We have stated in the past that hoaxes can usually be quickly identified if they are small, relying upon straight lines, with obvious imperfections, or include human symbols such as a face or a glyph. Hoaxers thus were paid to improve their techniques, and moved toward using circles, using machines that could produce swirls, and being larger. Unlike genuine crop circles, which are laid down almost instantly using computers on space ships in the sky and growth hormones to fold the grain in one direction or another, even weaving the grain, hoaxes must worry about foot prints. Nevertheless, even with generous funding and new techniques, one can quickly find evidence of machines on the ground being used for hoaxed designs. "The dead giveaway is that the circle is mashed in the second round, rather than laid as smoothly as the interim laid grain. One can see the outline of the machine made circles when mashing later occurs. Do the legitimate circle makers need to square off the ends to make them even? This cross lay is done for a sharp appearance, but shows that sloppy humans incapable of weaving grain were in charge. Then finally the design itself, which is a human symbol. "Why do hoaxes continue to be laid, ever striving for the excellence that legitimate circles have? There are still those in the establishment who wish the public to think the alien presence itself is a hoax, and fear the public learning the truth." "This is another fraud, as astonishing as this may seem to some. Compare the mashed manner in how the grain is laid down, compared to crop circles in 2004-2005 which were legit. The 2012 Milk Hill design has grain mashed over crudely, rather than bent at the node by a growth stimulant as in legitimate circles. The earlier circles, such as Silbury Hill in 2005, have the grain in large circles laid over in a circular pattern, whereas the 2012 fraud has the grain mashed laterally, in quarters, which can be readily seen. Silbury Hill even has the grain woven, such that a superimposed circle on top of a larger circle has the grain going perfectly in a circular manner. The 2012 Milk Hill gives evidence that it is a fraud in other ways too. All parts of the design are accessible, so that foot steps are not evident. Even the small circles at the tail are reachable with a machine arm." "Though at first glance this design looks legitimate, at close inspection various irregularities emerge. The spaces between the circles are not regular, nor the angle of the bubbles from the joints. Why would this be the case when legitimate circles do not have such irregularities. Frauds and hoaxes are getting more sophisticated, using swirling machines and ropes to measure length and angle measuring devices to align at a long distance. But they make mistakes, though unaware when the design is in process. Why are such frauds produced? They do not relay the truth as legitimate designs do, so like the disinformation on the causes of the Earth changes - the erratic weather and tides and evidence of the wobble – they seek to mix truth with fiction. All to confuse the public." "As circle expert Jeffrey Wilson has noted, the Chualar design is a fraud, done by man. The real area of interest here is why major media sites chose to feature this fraud so heavily. CNN, Yahoo, and HuffPost all featured it on their websites as a front page item. A decade ago all crop circles were either ignored or announced by the media as hoaxes. Men claiming they created the designs with boards would be interviewed by the media, who would ignore evidence such as grain bent at the nodes, growing faster after the designs were laid than unaffected grain, and radiation readings from the site. Why the change now, and why was the significant design laid in Wisconsin in 2003 near Nancy’s home featured so obviously on HuffPost? "This is clearly related to the pending announcement admitting the near presence of Planet X, aka Nibiru. As we have mentioned repeatedly, there are two cover-ups expected to drop during the announcement – the cover-up over the pending passage of Nibiru, and the cover-up over the reality of the alien presence. The US has been pressed for years to disclose what they know about aliens, as they were the site of Roswell and are known to have alien bodies and crashed ships. The same group of former CIA/DIA members and wealthy individuals who were inducted into MJ12 at the time of Roswell are resisting this, just as they are resisting admissions about Nibiru. "In that NASA found it necessary to mention Nancy’s name in the past, warning the public not to listen to her, and did so repeatedly in 2009 and through to their Fall 2012 Hangout on the Mayan Calendar issues, she is expected to get media attention after the announcement proving that she had been correct all along. But it is more than this that will rocket Nancy into the spotlight. ZetaTalk correctly predicted the path Nibiru would take into the solar system in the years prior to 2003, and much of this will be included in the announcement. Where did this astonishing information come from, if not from we, the Zetas, as Nancy claims? "Major media editors have been told in the past to exclude any information that indicates the Sun or Moon out of place, with a Second Sun rising or setting. They have also been told to exclude details about crop circle formation, to give the impression that they have been man-made. Now these editors are being coached on what to expect, told the National Security Directive by Reagan making these subjects forbidden had been lifted, and even requested to ease the shock the public is expected to experience when two, not one cover-up comes crashing down. Thus Jeffrey Wilson, a long standing and well respected expert on circle origins, is quoted in the HuffPost article not only declaring the Chualar formation a fraud, but declaring in the slides that the 2003 Wisconsin formation was legitimate. "Who laid the Chualar formation, and what was their intent? There are several clues that this was intended to be a pre-announcement nudge to get the issue of the alien presence into the media. The land was privately owned, and the crop intended to be plowed under as mulch eventually. How convenient. The land sloped such that it could not be seen except on over-flight. How handy. Workmen with GPS units and ladders were even seen in the area days before the design was discovered. Legitimate circle makers do not use Earth languages or work in rectangles, yet the Chualar design includes Morse Code and Braille. The message “ET ISON STS” is clear – the hype about ISON was a Service-to-Self scheme to detract from the real presence near the Sun, Nibiru." "The Ingress crop circle is not legitimate, though the hoaxers have gotten more skillful of late. There are three clues that this is so. The first clue is that the design could hardly be mistaken as anything BUT the Ingress game. The circle makers are not into providing profits for game makers, though using false crop circle designs to promote products has become a trend of late. The second clue is that Service-to-Other circle makers would not find worth in the premise of the Ingress game, that rather than free will for mankind the future will bring the opposite – loss of control. This would be a Service-to-Self message, but those in the Service-to-Self are not allowed to lay crop circle designs. The third clue is that the product is sloppy, the lines irregular." "This is, as many have suspected, a defaced crop circle. The XII has been added as have the hands of the "clock" and the two small circles at 6 o'clock. The original crop circle was meant to relay a sense of regularity, to what might be considered a clock or even a calendar of 12 months, that no assumptions can be made on the timing of what is to come, especially with the 2012 date. This was defaced to present an impression of being "too late". It is never too late in the efforts one can make to save oneself or others, and thus this would never be the message given by the circle makers." "The Badbury design is indeed a legitimate design subsequently altered by hoaxers who added maze wings. These attempts by the establishment to alter the message intended by the circle makers has been ongoing for several years. The team assigned swoops in without delay and defaces the original, paid well for their speed, but as can be seen from close inspection, not for their competence. Here again the original has pristine lines, even across the field tracks, where the defacement has sloppy lines. If one removes the maze wings from the design, the original can be contemplated. "The focus of Badbury is the Earth wobble, and the forces that drive it. We have described the pincher hold that Planet X has on the Earth as catching the Earth “in the cup”, so it cannot escape in either direction due to the eddy flow of particles coming round from behind Planet X. In fact, this circle design looks remarkably like Nancy’s drawing of the cup some years ago. "The Earth wobble has many facets, depending upon where Planet X is in its dither and depending upon whether the N Pole of Earth is leaning away from Planet X or toward it, during an opposition lean. Ultimately, during the Last Weeks, the wobble patterns fixate on a stopped rotation, the Earth frozen, with a subsequent release during the passage." The following chronological summary contains authentic crop circles interpreted by the Zetas from 2012 to the present time. Due to the increase in crop circle hoaxes and authentic crop circle defacing, significantly fewer legitimate crop circles have been reported since 2012. Strange, asymmetrical shapes. Wind damage or alien message? "The message in these crop alterations is not in the symbols but in the effect, which is a flattened crop. Crop shortages have been on the increase, and are such that already the UN begs for help for starving countries and gets a deaf ear from those who formerly had abundance. Starvation quietly proceeds in many countries, this fact slipping out of the media where formerly noisy campaigns to get help from the populace were conducted. The reason for the silence is that the establishment, which controls the media, does not want the populace to be aware of the extent of crop shortages, and thus panic. Crop shortages was an early prediction by ourselves, and thus this fact alone would lend credence to our warnings about the cover-up over the pending passage of Planet X. "In both Russia and Mexico, the flattening of the crops was recognized as being at the hand of aliens. The phenomena actually got better coverage because there were no recognizable symbols, and thus the establishment tended to ignore any media coverage. In both Russia and Mexico, this phenomena occurred in regions where plentiful crops are grown, which can be seen from the videos – lush fields, fully grown grain, not yet dried for harvest. In both cases the fields were subsequently harvested without loss, though extra effort was required due to the flattened grain stalks. The message? Be prepared for your grain to fail, in the future, and plot your course accordingly." "This is a genuine crop circle, as one can see from simply examining the weaving of the grain. There are intricacies such as thin line circles that end at the edge of another thin line circle, with no overlap. There is a deliberate break in the swath of circles also, where the field has broken grain, arranged so that the intent of the design uses the landscape, rather than fights against it. But it is the weaving of the grain, within the central circle, that shows this is a legitimate design and not a fraud. In the very center there are multiple tuffs each with a circle swirl around it, but the grain also continues to swirl in the larger circle, not something a fraud would accomplish. "What is the meaning of this design? Planet X has a retrograde orbit and this design shows this clockwise progression. When viewed from Earth, as is shown on the Path diagram Nancy developed from the details we provided at the start of the ZetaTalk saga in 1995, Planet X appeared first to sling left, then up, then right, then down before arriving at where it could be seen naked eye in the sky in March, 2003. Then the break in the circles where thin line circles begin. This break indicates a break in time, from 2003 until the passage. Going into the passage, Planet X will grow in size, looming as large as the Moon or the Sun in the sky, while also continuing in its retrograde orbit so it will align in front of the Sun, rather than to the right of the Sun in the view from the Northern Hemisphere as it does today." "The precision of the circles and the design overall, the circular lay inside the circles with a center tuff remaining – all show this to be a legitimate crop circle design. What is its message? This design represents the Earth wobble, which has lately become so noticeable with the Sun rising and setting in the wrong place that the common man is talking about it, even when they have not heard about Nibiru or Planet X or ZetaTalk. The wobble is palpable, to one merely gazing at the design – the flipping back and forth of the globe, with the N Pole being the focus of the push back and forth." "The serpentine dance between Planet X and the Earth, caused by the clash of their magnetic fields and direction of rotation and orbit, has tightened. Planet X has a retrograde orbit and rotation, while the Earth has the opposite. Their magnetic fields clash. The Earth attempts to accommodate this magnetic clash with her daily Figure 8 wobble, but as Planet X comes closer, is losing the battle. Earth wants to align with the Sun, the dominant magnetic influence in the solar system, but is virtually assaulted by Planet X. Eventually, Planet X supplants the Sun’s influence and it is then that the Pole Shift occurs." "Both these crop circle designs are genuine and both depict the Earth wobble. In France, the design shows the Sun’s magnetic field in the center. This is mirrored, in the vicinity of Earth, as Planet X comes closer, becoming more dominant as it is closer to the Earth. When Planet X is not present, only the Sun’s magnetic field is dominant. "For Holland, the 3 separate designs depict stages in the wobble. The first shows both the Earth and Planet X in their relative sizes. The second show the wobble developing. The third shows the contortions of the Earth wobble. One can almost feel the Figure 8 sway as the eye travels from left to right." "This design is legitimate, as shown by the weaving of grain. It is also an obvious reference to the Magnetic Trimesters due to room for 12 evenly spaced scallops along the periphery of the circle and 3 points touching this periphery from the center. The trimesters, shown by what look like squashed rectangles, are not identical, as the touch points along the periphery are not even. The trimester dates have been given as August 12, December 17, and April 20. Thus it is clear that the August 12 trimester change is being emphasized in this design, and of course being laid on August 6 this is close in time to the August trimester change. The Magnetic Trimesters cause an adjustment in the Earth, and as with all such adjustments there are consequences. Major earthquakes tend to occur clustered around a trimester change. A trimester change will tend to exacerbate any magnetic instability the Earth might be experiencing, as a trimester change is by nature a magnetic influence. This crop circle is an explanation of the Magnetic Trimesters, and also a warning." "Both these designs are legitimate, which can be seen by the woven grain laid in directions and in a manner that human frauds cannot accomplish. Westkennett was laid on August 13, a day after the August trimester reached its peak on August 12. This is shown by the dial just past the touch point at the bottom of the design. It has no other meaning than to emphasize the magnetic trimesters, which is a ZetaTalk concept and found only in ZetaTalk lore. During this past trimester change, earthquakes notably increased to the extent that LISS was taken down for weeks. "Etchilhampton has a clear retrograde orbit flow pattern from the center - clockwise. This is the orbit direction of Planet X, aka Nibiru. But if viewed from the periphery, the counterclockwise direction of flow for the other planets in the solar system and the Sun itself is detected. What then are the three small planets clustered on the periphery? The Earth, Dark Twin, and Venus all normally sweep counterclockwise, propelled by the Sweeping Arms of the Sun. They are now all being pushed back by Planet X, and crowded together. "The Sun itself is shown as centered on a vortex to its side, out of view of the Earth. The grain swirl pattern of the Sun is centered on this vortex. The lopsided coronal hole that appeared in 2013, lopsided compared to other years, is explained by the magnetic influence of Planet X pushing components in the inner Sun to the side and away from the magnetic presence of Planet X. Though overall the size of the coronal hole is no larger than in other years, the manner in which it is clustered to one side is different." "Most notable in this 2014 design is the pendulum like swing in the center. Crop Circle designs tend to focus on one aspect of the passage or another, as to do otherwise is to diminish the primary message of a particular design. This design is relaying the ferocity of the Earth wobble, which will ultimately evolve into the severe wobble of the Last Weeks. The Earth, in the center of the design, will flop its N Pole from top to bottom and back again in an attempt to evade and then align into opposition with the approaching magnetic field of Planet X. "Planet X is not passive during this approach, but dithers from side to side, likewise trying to evade the Earth’s N Pole by swinging its N Pole to one side or the other. What else would cause the Earth slings, unless something CHANGED? "The Hod Hill design is relaying the approach of Planet X as an oppressive and unstoppable force, surrounding the Earth which will thrash in its attempts to evade this force. The Earth wobble has recently worsened, and will worsen yet more steadily as the Pole Shift approaches. This is one of the strongest pieces of evidence that the passage is upon mankind, and thus evident, is in the subconscious of most of mankind at the present time." "The August Magnetic Trimester is approaching, and it will be a doozy. The Magnetic Trimester, a time when earthquakes and plate movements increase, will compound the already increased wobble, magnifying both. The Earth wobble is at its core magnetic. The magnetic N Pole of Planet X pushes the Earth when the Earth’s magnetic N Pole comes up over the horizon to encounter the hose of magnetons from Planet X. The violent push away requires a violent adjustment later in the day, the polar push and pump that has been in place since 2004. Note how similar these two legitimate crop circle designs are to those that presented in 2004, a triad theme frequently repeated by the circle designers." "This is a clearly legitimate crop circle design, with grain bent at the nodes and interwoven swirls. The most outstanding feature is the two orbs touching each other, one emitting outbound waves. Where the Earth has been affected by the magnetic hosing coming from Planet X over this past decade, and by licks of the wafting tail, this has been intermittent. This design is saying this situation will no longer come and go, but will remain until the passage has occurred. Mankind will find their problems with electromagnetic pulse and flux increasing, and the wobble increasingly violent, with no relenting. Venus and the Dark Twin, which are not magnetic, are not caught in this dance." "This design is genuine, laid down by the legitimate circle makers, which can be seen by the extreme precision of the lines. We have, during our crop circle analysis, ascribed concentric circles to a magnetic influence or clash. This can be seen in 2004 as Planet X approaches the Earth from below the Ecliptic, not aligned straight up with the Sun’s field and therefore creating a daily wobble in the Earth. This can be seen in 2006 in the design depicted clashing fields. And this can be seen in 2007 with the battering effect that the daily polar push by Planet X has upon the Earth. "So what does the 2014 design at Ironwell portray? There is an intense one-sided squeeze, the magnetic field of Planet X compressed where it encounters the Earth, the overall impression one of unrelenting intense magnetic pressure, which is expressed in so many of the Earth changes mankind is dealing with at present – planes disappearing from radar, GPS satellites malfunctioning or not accessible, and electrical appliances turning off erratically. There are few among the populace who will miss the meaning of this recent design, as the fact that the Sun and Moon are not in the skies in their expected position is subconsciously noted, even if a taboo subject in the media." "The fact that the crux of the Ironwell circle design (laid in the UK just six days earlier) is within this newest UK design indicates that both designs are about magnetics. Interference with the Earth’s magnetosphere will no longer be influenced by the magnetic trimesters, occurring three times a year. The interference will now be continuous, unrelenting, the magnetosphere of Planet X literally abutting the Earth’s field, their magnetospheres clashing and touching, as many recent crop circles have shown. This interference is indicated by the spike before the hapless Earth in the Arklane design. "This design has nothing to do with a 7 year prophecy. So why is the outer circle, indicating the larger magnetic arena, broken at 7 points? This is to eliminate the supposition that a clock or calendar is being represented, which would be the case if a 12 or 6 were represented, for instance. 7 is famous in a Biblical prophecy related to the Jewish Exodus, wherein the Pharaoh dreamt about 7 years of famine. This was prior to the last Pole Shift, so that upon seeing this design people will leap to the conclusion that it has something to do with the forthcoming Pole Shift, which it does! "What of the addition, laid some days after the original? This is a timeline design, giving the history of the magnetic effect of Planet X upon the Earth. First, at the right, it was far out in space and had a minimal effect on the Earth’s magnetosphere. Then as it entered the inner solar system in 2003, from below the Ecliptic, Planet X pointing its N Pole toward the Sun’s S Pole, Planet X began causing the Earth to wobble which began in 2004. When Planet X was close to the Sun, passing the Sun, it swung its magnetic S Pole outward toward the Earth, its magnetic N Pole virtually glued to the Sun’s S Pole. Thus, its magnetic influence was temporarily diminished. "Having passed the Sun and well on its way outbound, Planet X went into its first 270 roll, causing the Earth to have an increased wobble. During this time, the hapless Earth is still trying to align, magnetically, with the Sun. Thus the polar pins. At present we see the familiar magnetic squeeze design, where the Earth’s magnetic field is touching that of Planet X. The inference is that the Earth will lose its alliance with the Sun during this time, the Earth wobble going into gyrations at times, trying to align with Planet X and then swinging back to align with the Sun. After the Pole Shift, the magnetic influence of Planet X will return to being minimal." "Indeed this design is telling the story of the Dark Twin, which is posturing for a passage behind the Earth so it can continue on their shared orbit, no longer blocked by Planet X. There are two strong clues that this design is about the Dark Twin. One is the loop, an obvious reference to the path the Dark Twin is taking behind the Earth. And the other is the color scheme, where the Dark Twin is shown as an opposite color from the Earth, to differentiate it. The story of the Dark Twin, told from the left to the right, is that it came up behind the Earth and clashed, the Repulsion Force holding them apart. Then, cloaked in blackness as it is a coal black planet, it began its loop behind the Earth. Once past, it moves back into obscurity, becoming tiny in its influence upon the Earth again." "This design does indeed represent the relative influence of the planets in the cup upon each other. At first they influence each other slightly because they are at a distance – Venus in another orbit and the Dark Twin opposite the Earth in their shared orbit. Neither the Dark Twin or Venus are magnetic to any significant degree, so when at first crowded together in the cup they are less involved in the magnetic dance with Planet X than the Earth. As they are all squeezed into closer proximity with each other, they are able to batter the Earth. The Earth is central to this dance, the intensity of gravity and magnetic particles flowing around Planet X and the Earth. Venus and the Dark Twin escape the cup, leaving only the Earth to deal with the passage." "The Earth wobble has recently increased, such that the Sun is undeniably in the wrong place for much of the world. Deluge has increased dramatically. Wind storms are evident and notable for their violence. Earthquakes worldwide are commanding attention, even though the seismographs have been toned down to deny their magnitude. The Netherlands crop circle is showing what is pending in the future – the Severe Wobble leading into the Last Weeks. The Earth will flop from side to side attempting to placate the magnetic onslaught from Nibiru, aka Planet X. The closer Planet X comes, the more violent the wobble." "This modest design is describing the Earth’s stopped orbit and its relationship to Nibiru. The spiral in the center is to imply the Earth orbit, going round and round. The spiral outward implies the growing influence of Nibiru as it approached the inner solar system. The orb blocking the spiral, standing in the Earth’s orbit location, implies the point where Earth halted her orbit and began to back up. Nibiru’s influence is greatest at the hour of the Pole Shift, and thereafter it directly leaves the solar system, rapidly. It has scant lingering effects on the Earth during this exit." "The odd orbit of Nibiru is being introduced in the press lately, as opposed to the past when the concept of a traveling planet ranging a long way from one of its foci, one of its suns, was ridiculed. In 1995 when ZetaTalk began, this was the case. Then admissions began, where NASA et al disclosed they had discovered traveling planets which seemed to be out in space just tracking along. Then binary star systems where one of the stars was dead, unlit. Now admissions about life bearing planets are in the news. Nibiru has a long orbit between two foci, between two binary stars – the Earth’s Sol and an unlit dead sun some 18.74 Sun-Pluto distances away. "This Netherlands design is depicting the odd orbit of Nibiru, specifically the gravity influence of the foci it is leaving. On the right is the influence when it is close to the foci on the right. As it is impelled by momentum toward the second foci on the left, the influence is diminished. This is represented as a smaller and smaller circle. Past the mid-point between the two foci, Nibiru then hears the call of the foci it is approaching, represented by the circle within a circle. When close to this second foci, the influence of the foci it left is almost nil. When leaving the foci on the left, it leaves rapidly because of the Repulsion Force which is literally pushing Nibiru away. Then the cycle begins again." "These dual designs, both laid in the Netherlands on the same day, imply an intermittent influence. The orbs are of equal size, as is true of Venus, the Dark Twin, and the Earth. We have explained that these three planets are being pressed together in the Cup in front of the approaching Nibiru. The Dark Twin is slipping behind the Earth to escape this clash, and will eventually escape the cup to move along in their shared orbit. Venus likewise will escape, also close to the time of the Last Weeks, but in the meantime will intermittently clash with the Earth, looming closer." "The Gropiusstadt, Germany design has an uneven distribution of 5 circles. That there is an uneven distribution is immediately apparent, the dominant message in this design. The Gray, Tennessee design shows an even 3-way distribution of intertwined influences. How is it that 3 are even, but 5 not? It is immediately evident in the Mantondrove design in England that the distribution of the 4 half circles around the outer edge is again distinctly uneven. There are 13 spikes from the center, but the half circles are 3, 3, 3, and then 4 spikes apart. Why the difference? "At present, the strength of the Earth wobble has caught the attention of all on Earth. This may not be admitted by the authorities, may be a forbidden subject in the media, but the common man has noted one or more symptoms of the wobble and given The Call on this matter, thus learning about the true source of the wobble from alien contact. This is not merely a shoving contest between Nibiru and the Earth, as the Earth is trying to align with the Sun’s magnetic field too – 3 magnetic influences. At present, the Earth maintains her normal posture, which is to align with the Sun, treating the Nibiru interference as temporary during the daily wobble. "But as the planets caught in the cup – Venus and the Dark Twin – loom closer during the increasing squeeze, other influences will destabilize the structure of the daily wobble. These three equally sized planets in the cup will bounce off one another, pressed together and then repulsed by the gravity Repulsion Force, so the predictable Figure 8 of the wobble becomes erratic and unpredictable from one day to the next. The populace may have become familiar with the Sun rising too far south or north, but now the sunrise will be in an unexpected place. Thus the wobble will be noticed anew, and under discussion." "What is notable in the circle designs in Europe (Italy and Germany) during the first week of June, 2015 is that they have a single focus – a circle most often with sun-like radiation arms emitting from the center. Crop circle designs most often have complexity, indicating Nibiru’s passage through the solar system or the interaction between various planets like Earth, Venus, and the Dark Twin. They tell a story. But these single focus designs are making a statement. The Earth is no longer on the periphery of the drama, but center stage, squeezed between the two sister planets – Venus and the Dark Twin – with Nibiru coming at the Earth full bore." 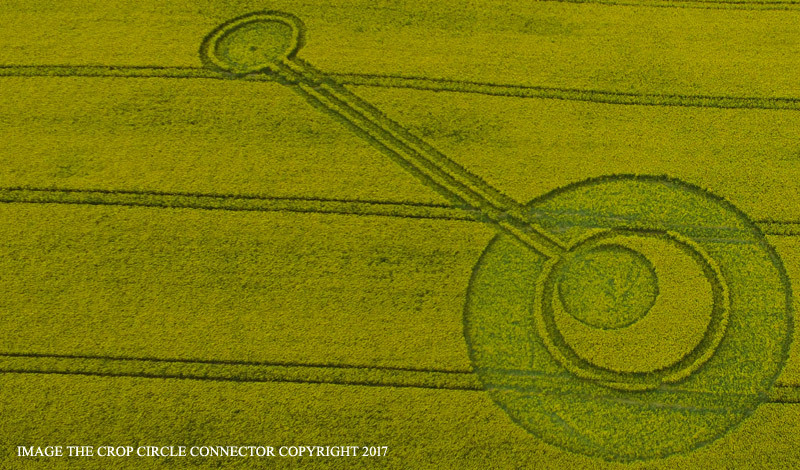 Intricate crop circle design in Muncombe Hill, England reported on July 14, 2018. Seeds from crops where crop circle patterns have been embedded in the field late in the season grow four times as fast as control samples. Scientific research in the field is based on the work of biophysicists, who in the 1990s discovered plants from crop circles had elongated and pliable plant nodes that allowed rigid plant stems to be bent without breaking. "They were very interested in developing this as a way to speed up the growth of crop seeds," said Professor Richard Taylor, who lectures in art, physics and psychology at the University of Oregon in the United States. He said more effort should be made to figure out the who and the how of crop circles. "I just find it absolutely fascinating that each year around the world these crop circles keep on appearing and it remains a mystery," Professor Taylor said. According to websites that keep track of crop circles, there have been more than 12,000 created around the world. Australian nurse Megan Heazlewood has been studying crop circles for 15 years. "Crop circles have appeared in all sorts of crops, even silverbeet and rice paddies," she said. "But the ones in canola are the most extraordinary in my opinion ... canola has a consistency like celery. If you bend canola, at 45 degrees it snaps. "In canola fields the plants are bent at 90 degrees to an inch above the ground. "The whole stem lies parallel with the delicate flower heads intact. "If you stomped a crop of canola down you would get mush — the delicate flower head would be totally destroyed. But in crop circles eventually the plant will stand up again." 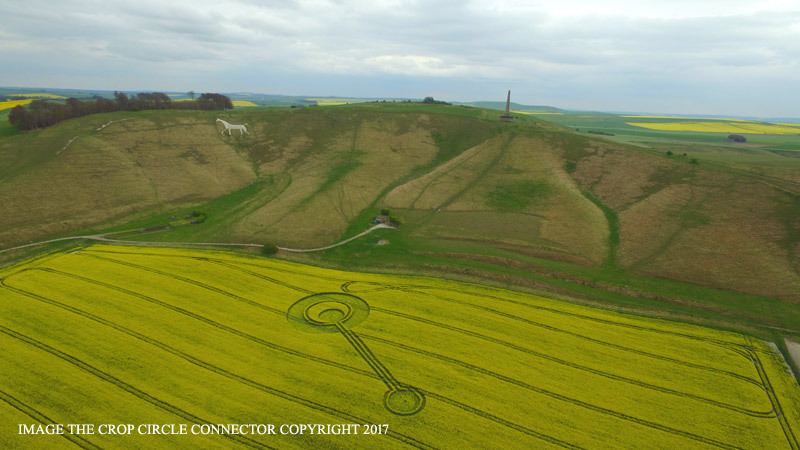 For Ms Heazlewood, the crop circle art forms — which often appear in remote and hard to access locations, with designs layered with symbolism — are not the work of humans. "Crop circles are made by a ray which incites a growth hormone in the crop, combined with wind action caused by changes in the air over the spot to be swirled." "The grain lies flat because the structure of the stems has been altered, one side of the stem rapidly growing in a process the reverse of what occurs when growing plants bend toward the light. This growth spurt occurs low to the ground, the particular ray, like laser surgery, focused there. The swirls are created due to the circular motion of the affecting ray, which circles like the hand of a clock, dropping the grain stalks such that they fall almost simultaneously." Stonehenge, Nr Amesbury, Wiltshire. Reported 8th July. Interesting crop circle at Mammendorf, Bavaria Germany - reported on July 23. "This design is huge and with crisp outlines and grain bent at the node throughout the complicated design. It is thus unquestionably legitimate. The message from the circle makers is clear – pay attention to this design, and grasp its meaning! In our recent ZetaTalk on the heat waves afflicting parts of the Northern Hemisphere, we emphasized the role of the daily Figure 8 wobble. Temperate regions are being pulled sideways into more tropical sunlight, thus the heat over the western side of the N American continent and from Persia up through Europe. "The July 23 Bavaria design has a wobble message. We have in the past mentioned a wobble within a wobble that would emerge, but did not detail the effect of such a redundant wobble. As this is about to emerge, we will detail the effect now. The Figure 8 does not stop merely because the globe has had its N Pole pushed away into a temporary period of darkness for the Northern Hemisphere. Even while dealing with unusual darkness, the population affected will note the Figure 8 swings to the left and right. Likewise for any temporary leans into opposition or leans to the left or right."